Yes, Nutella Hot Chocolate 🙂 Thank you pinterest!
. 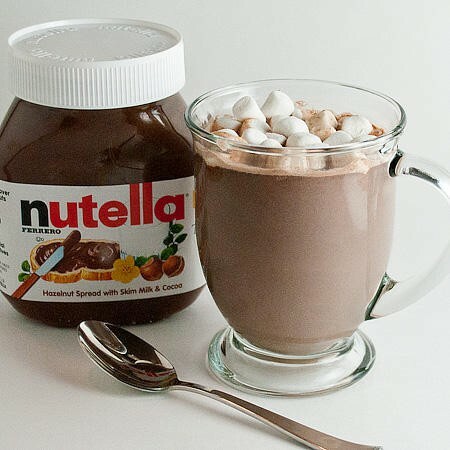 Nutella Hot Chocolate -1 cup of milk (any kind of milk will work) -2 spoonfuls of Nutella (this is my preference, but feel free to add as much or as little as you like) -whipped cream -mini marshmallows Directions: Pour about 1/4 of the milk into a saucepan on medium-low heat. Add the Nutella and whisk until blended. Slowly stir in the remaining milk. Add a pinch of cinnamon and whisk until hot and frothy. This spring when our broccoli was in full swing, I HAD to figure out a way for my dear, sweet husband to eat more of it… which proved to be difficult because he is not a fan of cooked broccoli. I ended up throwing together come broccoli cheese smashed potatoes, and they were a hit around here! Let me tell you, these were a WINNER! You’ll have to forgive me here, this isn’t going to be one of those exact recipes… mashed potatoes never are. It’s the kinda thing where you dump and mix and taste. But, I’ll give you a few of my tips and tricks since you asked. Now, I think the crucial part to mashed potatoes comes before you cook them. First, your scrub those babies down. Then, cut them, and put them into a pot of cold water. When i have cut all my potatoes, I then drain out all the water, and put fresh, cold water in the pan. At this point, I liberally salt the water and put on the stove to boil. Why do I salt at this point? Truthfully it’s the only time I add salt, and somehow int he cooking process it perfectly seasons my potatoes. If I wait until afterward, I feel like I’m trying to cover up a bland potato. The salt really draws out the flavor during cooking, trust me. Once your potatoes are falling apart when you pick them up with a fork, you’re going to drain, and return to your pan. Add a liberal amount of butter. I man the real deal. Then, you want to smash up those spuds. Once they are all broken up pretty well, add seasonings: pepper, garlic, rosemary, and add a few splashes milk. Then mix it up with your masher until they start to come together. Add a little milk at a time until you get the consistency you desire…. little by little is the way to go, and the way to avoid runny and thin potatoes! 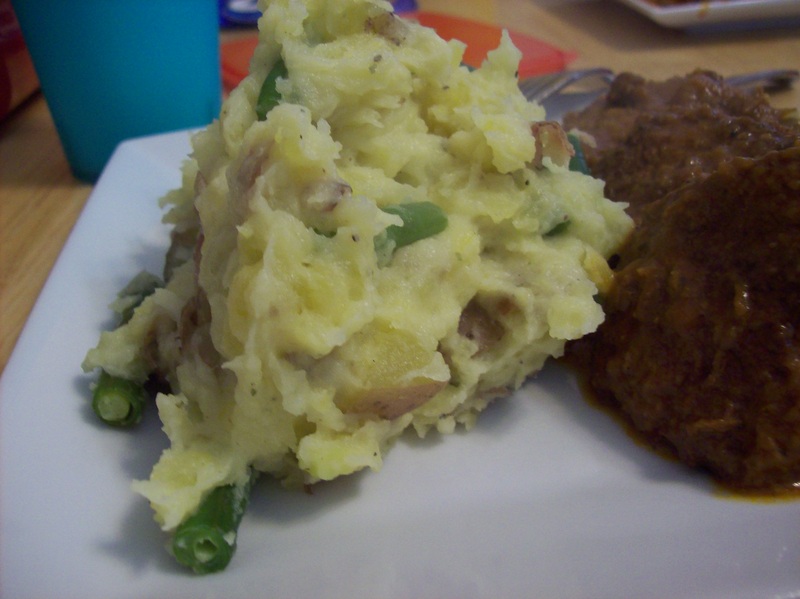 At the very end, toss in steamed and seasoned green beans, and serve!